Faced with hard work and poverty most days of the year, holidays offer a form of empowerment for Cambodians. KAMPOT, Cambodia–In the expensive (and cheap) bars and restaurants and in the haughty expat circles near Villa Vedici in southern Cambodia, a common complaint is emerging: Too many Cambodians are taking to Christmas. Even worse, there doing so with greater passion each passing year and, as a result, are demanding more time off to celebrate the holiday. Additionally, New Years — known here as International New Year — also commands a strong following among ordinary Cambodians. But for the highly industrious capitalist class who arrived here from afar, the idea of further time off to mark an essentially Western custom in a Buddhist country is an absolute heresy. No doubt Cambodia already has more public holidays than nearly anywhere else. Cambodians can take 27 days off a year in government-approved holidays. These are dedicated to all sorts of customs and heroes, form the country’s Buddhist and agrarian past, to the King’s birthday and the start of the ploughing season. The United Nations also shares pride of place ever since the early 1990s when a two-year UN occupation shepherded in Cambodia’s democratic transition. As a result, causes the UN holds dear like International Women’s Days are also treated as holidays. Add into the mix ethnic Chinese, Muslim, Hindu and the Judeo-Christian, Western celebrations, delivered with all the gusto that might be expected of a band of charities and NGOs that take up 52 pages in Cambodia’s Yellow Pages. Scrooge never had it so bad — but it’s his own fault. Cambodians, by and large, earn a pittance. Their lives are a far cry from the obvious wealth of the rich and politically connected known locally as the Khmer Riche, nor do they enjoy the luxuries considered the bare essentials by chardonnay-sipping expats. Ordinary Cambodians are lucky to make $100 a month working six days a week producing brand name garments for Levis-Strauss or The Gap. Most survive on less than the $1.25 a day that the World Bank defines as the absolute poverty line, in contrast to the “fortunes” of the multitudes of people earning a whopping $1.35 a day. 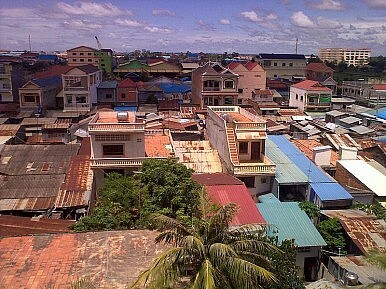 The reality is for cash-strapped Cambodians, holidays are a form of empowerment. For captains of industry who complain about the costs of business, the argument among the Khmer is “time is free and you have plenty of it.” Whether it’s true or not is irrelevant. Scrooge and his pricing policies have left an indelible mark on this country, and its people retaliate by celebrating Christmas. Cambodian children like bright lights, presents and Santa Claus, while adults are happy to wish each other peace and goodwill. All age groups can take satisfaction in knowing that the end of the International Year is near and maybe, just maybe, next year will be better than the last. It would be a brave Scrooge to deny them this hope.